Todd Barksdale poses for a portrait at the Partnership for Families, Children and Adults on Thursday, Nov. 29, 2018, in Chattanooga, Tenn. Mr. Barksdale received aid from the Neediest Cases Fund to help repair his truck after dedicating years of his own service to the Partnership for Families, Children and Adults' Services for the Deaf and Hard of Hearing program. Fifty-year-old Todd Barksdale has been deaf since he was an infant. Over his adult years, Barksdale experienced the normal personal and financial up and downs many people with permanent disabilities face, but he always found a way to keep moving forward. Ten months ago, that changed. Barksdale was stuck. Barksdale, who lives in Rock Spring, Ga., has worked for Chattanooga-based ERMC in general maintenance for the past eight years, continuing in a field that has provided him income for three decades along with a monthly disability check. "Todd really loves his job, getting up every day and going to work," said Pam Smith, director of deaf services for the Partnership for Families, Children and Adults. The Partnership, a United Way agency, has provided social services, including deaf services, for 141 years. Barksdale's part-time job was threatened in February of this year when his 2003 Nissan Frontier quit running. The estimated repair cost was $920 for a distributor, starter brakes and rotors. With a monthly income of $1,685, Barksdale could not afford the repairs. The federal government reported that 40 percent of American households in 2017 did not have $400 to cover a financial emergency. "I didn't have any money. I was stuck," said Barksdale through Partnership interpreter Charity Painter. After 20 years of being an active supporter of the Partnership's deaf programs, Barksdale never could have imagined that it would be the Partnership, in conjunction with the Times Free Press Neediest Cases Fund, that would provide the $920 in a one-time gift that put his truck back on the road. "I was so relieved, more than I can say," Barksdale said. "I offered to pay them back, but they said that wasn't necessary. It was a blessing of the Lord. I was scared to ask for money because you just fear that you will ask and then people will walk away." Smith said the Partnership never hesitated to help Barksdale. She contacted the Neediest Cases Fund, received $500 and the Partnership added the balance. "Todd supported the Partnership for years, and it seems like this time we are able to support him," Smith said. "Everyone sees his loyalty and his kindness. The deaf can become isolated so we get them together in social activities, classes and workshops. Todd's been with us through all of our moves around Chattanooga." Chattanooga Times Publisher Adolph Ochs started the Neediest Cases Fund in 1914 to help local people in financial need with one-time donations intended to help people get back on their feet. The charity provides the opportunity for readers to support their neighbors through financial donations during the holiday season. The United Way of Greater Chattanooga manages the fund, screens recipients and issues money to partner agencies. "The Neediest Cases fund is unique because of the one-time-per-recipient nature of the funding," said Carmen Hutson, director of Stability and Community Programming at United Way of Greater Chattanooga. "For an individual or family in crisis, the support they receive from the Neediest Cases fund can be a lifesaver. We view it as a one-time stepping stone that sets recipients on a trajectory of success and self-sufficiency." Barksdale's mother recognized his hearing deficiencies when he was 15 months old. She decided to teach her young son how to deal with the disability rather than try to fix his hearing. Barksdale grew up in Brainerd but moved to Red Bank where he attended school in the early 1980s. He attended the Tennessee School for the Deaf in Knoxville and graduated in 1986. It was during that time that Barksdale attended a Tennessee football game at Neyland Stadium for the first time. "I have loved the Vols all my life, all sports," said Barksdale, decked out in a Tennessee shirt underneath his Tennessee winter jacket. 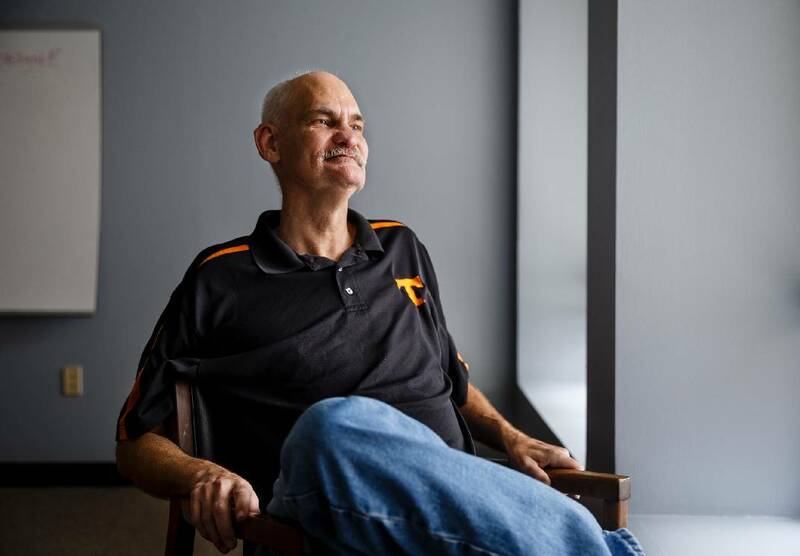 His boss at ERMC gave him two tickets to a Vols' game in 2017, and Barksdale revisited Neyland Stadium for the first time in more than three decades. "Looked pretty much the same to me." Barksdale followed the Vols and new Coach Jeremy Pruitt in 2017 and offers a low snarl at the idea that Pruitt grew up in North Alabama and won national titles at the University of Alabama. And like Vol fans everywhere, Barksdale has an opinion about next year. "Pruitt needs to get better," he said. Contributions through December will be acknowledged in Sunday editions of the Times Free Press beginning today.